Fancy a cup of cosmic tea? This one isn't as calming as the ones on Earth. 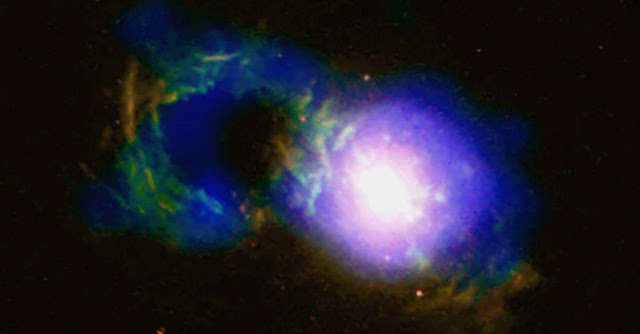 In a galaxy hosting a structure nicknamed the "Teacup," a galactic storm is raging. The source of the cosmic squall is a supermassive black hole buried at the center of the galaxy, officially known as SDSS 1430+1339. As matter in the central regions of the galaxy is pulled toward the black hole, it is energized by the strong gravity and magnetic fields near the black hole. The infalling material produces more radiation than all the stars in the host galaxy. This kind of actively growing black hole is known as a quasar.